Does biodiesel production impact food supplies? Learn about the “fuel versus food” debate, examine scenarios showing impacts and factors considered by scientists trying to unravel this complex question. 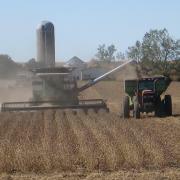 Harvesting soybeans in Nebraska. Photo: F. John Hay, Extension Educator, University of Nebraska-Lincoln Extension. Does Biodiesel Production Cut into Food Supplies? Before getting into the details of the food versus fuel debate, we would like to offer a clarification. Only two different major types of biofuels are used as transportation fuels at the present time: ethanol and biodiesel. Ethanol is made from corn, sorghum, or sugar cane, and is used in engines that run on gasoline. Biodiesel is made from vegetable oils or animal fats, and is used in diesel engines. Worldwide, significantly more ethanol is produced than biodiesel. In 2008, the United States produced roughly nine billion gallons of ethanol, and nearly 700 million gallons of biodiesel (Renewable Fuels Association; National Biodiesel Board). Most of the food versus fuel debate involves ethanol. We will focus on biodiesel in this article. For more information on ethanol and food, see Food vs. Fuel Biofuels Debate. John Gardner, Vice President of Economic Development and Global Engagement at Washington State University, explains that biomass (which includes oilseed crops) has historically had five general uses: food, fuel, animal feed, fiber, and functionality (cycling back into the ecosystem). Societies must always make decisions about how to allocate biomass use among these five. It can be difficult to tell if oilseed production for biodiesel is cutting into food supplies, since many outside factors influence food prices, including trade policies, worldwide population growth, and bad weather, which reduced yields in many countries in 2007 and 2008. One way of gauging the effect of biodiesel production on food prices is to compare changes in how much consumers pay for food, with changes in the price farmers receive for oilseed crops. For example, in the United States, as the price of oilseeds bought from farmers peaked in 2008, so did food prices to consumers. The food versus fuel debate was covered widely at this time, with several articles in national news magazines. But when the price of oilseeds from farmers fell, food prices to consumers dipped just a bit. In reality, the ingredients in food are just one small part of the price of food. Vegetable oils in particular are a small part of most foods. Figure 1 shows that the price farmers received for soybeans (the major oilseed crop in the United States) more than doubled from the beginning of 2007 to mid-2008, and then dropped by over 40 percent before starting to rise again through 2009. This time period coincides with the period of rapid growth of the biodiesel industry, which reached a peak production of 700 million gallons in 2008. Although other oils are used in the United States, soy oil is by far the most common, and the prices of other oils tend to follow soy oil prices. When the price of soy oil dropped, consumer food prices continued to rise through the end of 2008, peaking as the price of soybeans hit a low in October, and falling barely two percent in 2009, as shown in Figure 2. This indicates only a weak connection between the price paid for soybeans, which is determined by supply and demand, and food prices paid by consumers. One other very relevant factor with a significant impact on food prices is the cost of energy, and, in particular, petroleum. Petroleum, mainly in the form of diesel fuel, is used throughout the food chain in tractors for growing the commodity crop, for chemical and fertilizer manufacture, in trucks to transport the raw materials to processing facilities, and for distribution to the end-use consumer. Therefore, the price of petroleum can affect the final price of food to consumers. The following graph (Figure 3) presents data on the monthly price of diesel fuel from 2007 through 2008. The price nearly doubled during this brief period of time. From these data, it does not appear that processing oil into biodiesel is cutting into the U.S. food supply or affecting the price of food at the present time. These data represent only a brief snapshot of the economic balance between food and fuel. Increasing yields of oilseeds will play an important role in the ongoing balance between these two societal needs. If, as a country, we were to decide to vastly increase the amount of acres devoted to oilseed crops for biodiesel production, this could conceivably cut into food production. For example, in order to grow enough rapeseed (which produces more oil per acre than soybeans) to replace the petro-diesel currently used for on-highway transportation in the United States, all available harvested and idle land would have to be given over to rapeseed (Van Gerpen et al., 2007, pp. 15-16). Obviously, this would not be a good idea for our country. In the United States, meal from soybeans is used primarily as animal feed. Biodiesel production uses only the soy oil, which is normally extracted from the beans before feeding the soy meal to livestock. Therefore, use of soy oil for biodiesel does not prevent animals from eating the soy meal left after the oil is extracted. Other oilseed meals, such as canola meal, are also used for animal feed. 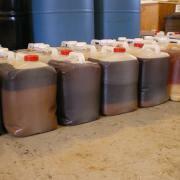 Used vegetable oil collected for processing. Photo: Richard Wiswall, Cate Farm, Plainfield, Vermont. Biodiesel can be produced in a way that does not cut into food supplies. For example, it certainly makes sense to use waste oil and fat from restaurants and food-processing plants to produce biodiesel. It makes sense to use extra stocks of oil not needed for other purposes, to research new oilseed crops that can be grown on marginal land and to use non-edible oils from plants already growing in many areas. Scientists are currently researching ways to produce biodiesel using new feedstocks that are less limited by the availability of land. For example, some types of algae can produce oil. Scientists are also experimenting with producing fuel from inexpensive, non-edible biomass (such as agricultural residue, waste from the wood products industry, and switchgrass and other grasses) that can be converted into a diesel fuel replacement. Biodiesel could be seen as just one part of an overall plan to reduce U.S. dependence on foreign oil and reduce our carbon footprint. Biodiesel could be seen not only as one way to displace petroleum-based fuel but also as a way to help farmers by providing an additional market for oilseed crops, particularly those grown primarily for animal feed. Farmers can grow oilseed crops in rotation with food crops such as wheat. Rural communities may benefit from having biodiesel processing facilities that supply jobs and other sources of income to the surrounding community. Small-scale biodiesel production that makes use of local crops and supplies local energy needs could be a viable solution to energy needs in rural areas. A 2012 article in Food Policy journal makes the point that, because biofuels tend to increase income to farmers, those farmers who are net sellers of food will probably benefit economically. Laborers on those farms would also benefit. However, higher food prices could cause increased food insecurity for the urban poor or for those farmers who are net buyers of food. The article states that it is difficult to know exactly how increased use of biofuels might affect the poor because “there are few systematic efforts to track the pathways of biofuel production trends from the major producing countries to the developing world through models that account for the forces of global supply, demand and trade” (p. 440). Biodiesel: An Alternative Fuel for Compression Ignition Engines. Van Gerpen, Jon H., Charles L. Peterson, and Carroll Goering (2007). St. Joseph, Michigan: ASABE. “Population Growth, Increases in Agricultural Production and Trends in Food Prices” by Douglas Southgate. This article from the Summer 2009 issue of Electronic Journal of Sustainable Development provides a historical perspective on global food prices. Freeways to Fuel. Utah State University and the Utah Department of Transportation are experimenting with growing oilseed crops on unused land near roadways, airports, railroads, and construction sites.